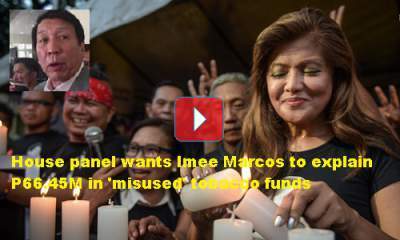 Imee Marcos’ lawyer, Joseph Cadiz slams the allegations of House Majority Leader Rodolfo Fariñas who allegedly uncovered cash advance checks amounting to P66,450,000 in tobacco funds as premature politicking. [VIDEO]: Majority Leader Rodolfo Fariñas and two of his deputies initiate a House probe into P66.45 million worth of allegedly misused tobacco funds in Ilocos Norte. Fariñas seems to put all the blame on the governor, Imee Marcos. This is just because she signed the requests and approved the checks which are the protocol. Since 1998, the Fariñas and Marcos families political relationship is on and off in Ilocos Norte after the late president Ferdinand Marcos died in 1989. In 2015, the Marcoses finally cut ties with Fariñas. They dropped him from their “One-Ilocos Norte” line-up which could cause the bitterness he felt. The situation can easily be handled properly if his intention is to ease the burden of the barangay captains. A discrete dialogue with the governor can certainly help. Since he opted to announce this to the media as immediate accusations, then he has his own political motive.